CREEK FRONT COUNTRY COTTAGE WITH AG ZONING! Welcome home! 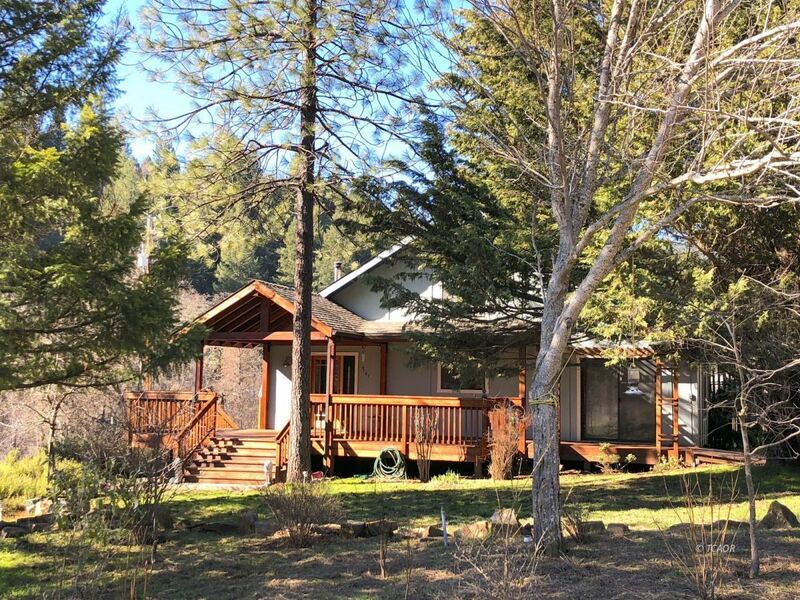 Creek-front acreage zoned Agriculture, with an inviting, warm home nicely situated on the 6 acres to offer the most privacy, and within earshot of the year-round creek. Main level of home offers a great-room style kitchen & dining area that's open to the living room with wood stove & monitor heater plus wall A/C; large utility room, mud room, full bathroom, and spacious bedroom with a sliding glass door leading to the front deck. Beautiful hardwood flooring throughout traffic areas, with carpet in bedrooms. Upstairs master suite is spacious & cozy. Zoned Agricultural, most of the property is gently sloping & has southern exposure, with a slight drop-off to the expansive creek front area where there is a fenced veggie garden. One of the many highlights of this property is the approx. 500' of creek frontage, including a waist-deep pool to enjoy in the summer! There's also a very comfortable, spacious 'artists studio' for extra space for guests and hobbies, grande chicken coop, storage shed, and securely fenced back yard. If commercial cannabis is of interest, this property appears to meet the criteria for licensing and without too much work this could be your next biz!